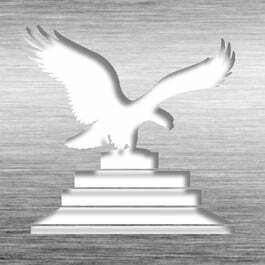 Whether it is the 20th or 50th patent grant, show your appreciation for an individual inventor's significant contributions to the company's overall achievements. Layouts are designed to specifically highlight important patent grants such as First Issue, Most Successful, Most Recent, etc.., layouts can be modified to accommodate your needs or the number of patents granted to each inventor. Plaque is engraved on a premium Black Metal Plate, mounted on a piano finish wood board, and accented with a bright metal trim. Available in different sizes for 5, 10, 20, or more patents. Also available in our Gold HD or Silver HD Plates. 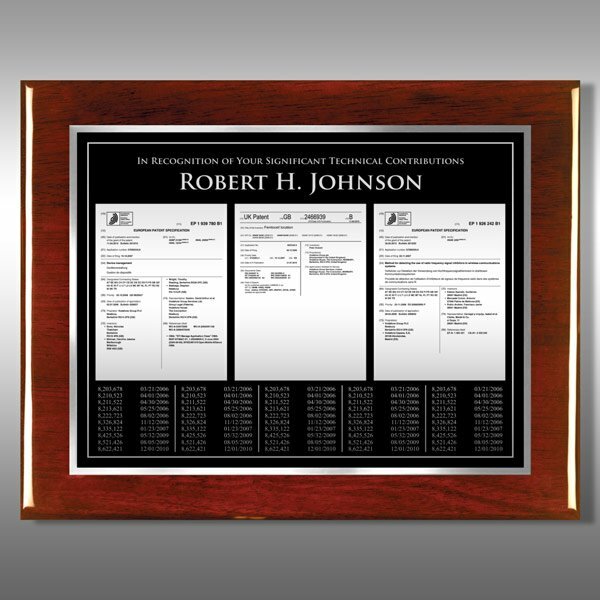 This Patent Plaque - Rosewood Milestone RP50-B20M is part of our Portfolio Series of products, check out other products & options available in the Portfolio Series of our selection. This Patent Plaque - Rosewood Milestone RP50-B20M can be modified to your requirements and is available for your corporate award programs.